Ford is a precious little boy from China that just turned 1 year old. Ford has mild CHD (ASD) and was born with syphilis and Hep C, which are both generally treatable. One of our GWCA staff members met Ford when she visited China earlier this year and she would be happy to speak with any interested family about Ford! Ford can crawl, stand up by himself and is learning to walk. He can grasp toys near him, can take blocks and put them in and out of cups, and he can go look for toys when he drops them. He knows his name and turns to look when called, he responds to his caretakers asking him for objects, he babbles and imitates words, and he can take his socks on and off by himself. He is fond of listening to music and likes to laugh when teased by his caregivers. 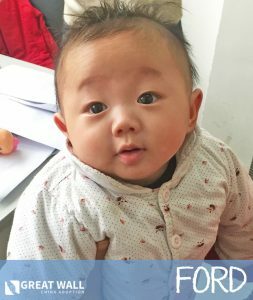 You can contact the China Home Finding Team at Great Wall if you would like to learn more about adopting Ford. We hope we are able to find Ford his Forever Family soon! Click Here to Watch a Video GWCA Staff took of Ford when He was just 5 Months Old! You can see more videos of Ford when You Request to Review His File! 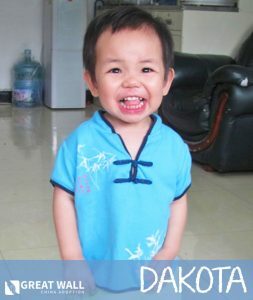 Dakota is a cute little girl from China that 2 and a half years old. Dakota was diagnosed with rickets when she was younger but has been receiving treatment since she was little and it has gotten much better now. She has hearing loss in both ears, but she is not completely deaf. She communicates with a combination of signs and words. Dakota has been living with a foster family since September 2015 and so she has been receiving much better one-on-one care than she would if she lived in an orphanage. One of our GWCA staff members met Dakota when she visited China earlier this year and she would be happy to speak with any interested family about Dakota! Dakota can be a bit shy around strangers but she interacts well with familiar people. She likes to watch TV, play with colorful toys and outdoor activities. Dakota has good fine motor skills, such as using a pen to scribble on paper. Dakota can walk on her own steadily. Dakota understands the meaning of “no” when directed to do something by her foster family. Dakota likes listening to music and tends to be energetic. You can contact the China Home Finding Team at Great Wall if you would like to learn more about adopting Dakota. We hope we are able to find Dakota her Forever Family soon! Glenda is a precious little girl from China that is 1 and a half years old. Glenda was born low birth weight and she has been diagnosed with cerebral palsy. She is so young though that it is unclear if her CP is more minor, moderate or more significant. Glenda receives regular rehabilitation and she has gotten much strong over the last several months. She enjoys listening to music and receiving cuddles from her caregivers. Glenda’s file is a little out of date, so we are working hard to get more updated information on Glenda. 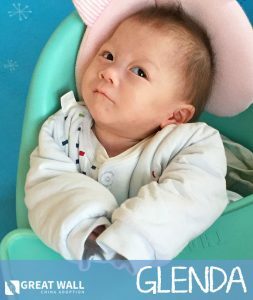 You can contact the China Home Finding Team at Great Wall if you would like to learn more about adopting Glenda. We hope we are able to find Glenda her Forever Family soon! Han is a sweet little boy from China that just recently turned 1 year old. Han was born premature and has a little bit of a cerebral gap, but other than that he seems to be a normal little baby boy. Han is an extroverted little boy that has a lot of curiosity! He loves to explore outside and try new things. He plays outside almost every day which he enjoys very much! He likes to have attention from his caregivers, and when he doesn’t get enough attention he gets upset. 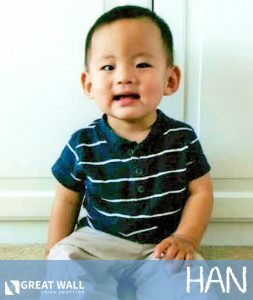 Han is described as being a very smart child and when you hold him and talk to him, he will listen very intently. Han likes to be held and cuddled. He enjoys “chatting” with you by babbling different sounds that he imitates from others. He knows his name when called and he will turn toward the person who calls him. Han can sit up by himself and can crawl on his own. He is learning to walk by using a baby walker which he pushes around when he plays. He likes listening to music, playing with toys and swimming in the pool whenever he has the opportunity. Han has a very big appetite and he enjoys eating rice, fruit puree, meat and steamed eggs. Han really likes drinking milk and he is not at all a picky eater. You can contact the China Home Finding Team at Great Wall if you would like to learn more about adopting Han. We hope we are able to find Han his Forever Family soon! Abe is an adorable little boy from China that is one and a half years old. Abe was born with CHD, specifically an ASD, but he seems to be doing well now. He has slight hip dysplasia of one side of his hip. Abe’s file indicates that otherwise he has normal physical development at this point. Abe can crawl, stand steadily by himself and can walk by holding on to something. Abe can take off his own socks and shoes. He understands the meaning of the word “no” and he is babbling and imitating the words of adults. Abe likes to play with other children and will not fight over toys with his peers. He likes to go outside to play and his enjoys playing hide-and-seek. 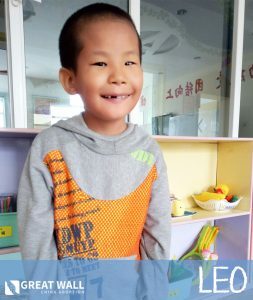 You can contact the China Home Finding Team at Great Wall if you would like to learn more about adopting Abe. We hope we are able to find Abe his Forever Family soon! This cutie’s name is Benjamin, and he is two years old! He has difficulty straightening out his wrist, elbow, and knee joints, as well as strephenopodia of his feet. 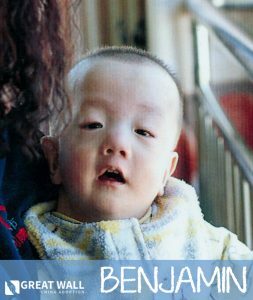 Benjamin would likely do very well with physical therapy and orthopedic treatments. Benjamin also has an un-descended testicle. He’s described by his caregivers as being talkative, cute, and extroverted. He loves to smile and be cuddled by his caregivers! He would thrive with the love of a forever family. Please reach out to Great Wall if you would like to learn more! Meet Josie! Josie as a sweet 8-year old girl in need of a forever home. Josie is blind in both eyes, but her doctors indicate that there is the possibility of regaining some vision with proper medical treatments. 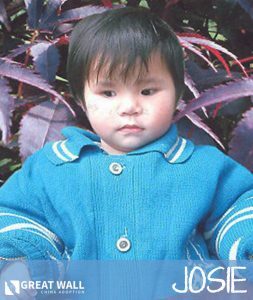 Josie’s caregivers describe her as a very beautiful and intelligent little girl, saying that she loves to play with other children! She’s a happy kiddo who loves to listen to music and play with toys. Her caregivers say that she can be timid and shy due to the fact that she cannot see others, but overall she is very sweet and affectionate. Please reach out to Great Wall if you would like to learn more! 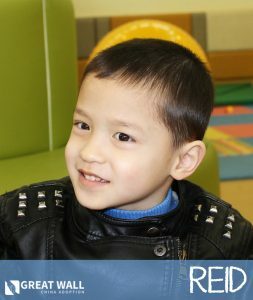 Reid is a cute little guy who is 5 years old! He has some motor development delays and his file indicates he has Cerebral Dysplasia. Reid has been receiving extensive rehabilitation services since arriving at the institute. These services have helped him tremendously. Reid needs the assistance of a walker to get around but he seems to do very well with it. He can understand instructions and what his caretakers ask of him. Reid can express his needs to his caretakers and interact with his peers! He loves to listen to music and watch television! GWCA is asking for more updated information on Reid. Contact one of our matching specialists today if you’d like to review his file! Renee is a sweet little girl from China that is almost 1 year old. Renee was born with CHD but it appears to be very minor and she has not needed surgery for it yet. Renee has some auditory issues but she currently is able to hear with a hearing aid. Renee appears to be doing very well and is living with a Foster Family. Renee is from one of GWCA’s new Orphanage Partnerships. 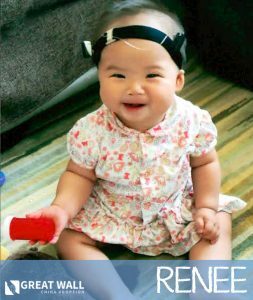 To learn more about Renee or how you can adopt a Special Focus child with a combination of more minor needs, please contact the China Home Finding Team. Meet Robbie! Robbie is a 7-year old kiddo with Down syndrome. 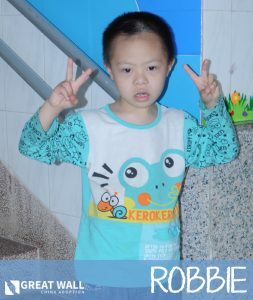 Robbie is described as by a very sweet, shy kiddo who is loved by his teachers and the other students. He loves puzzles and helps out his caregivers by doing housework. 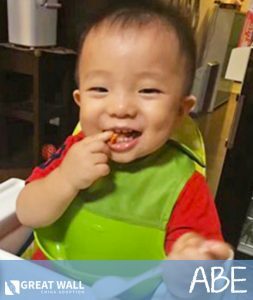 He is a happy child who would thrive with the love of a forever family. Please reach out to Great Wall if you would like to learn more! Benjamin looks like Alfred from New Day!